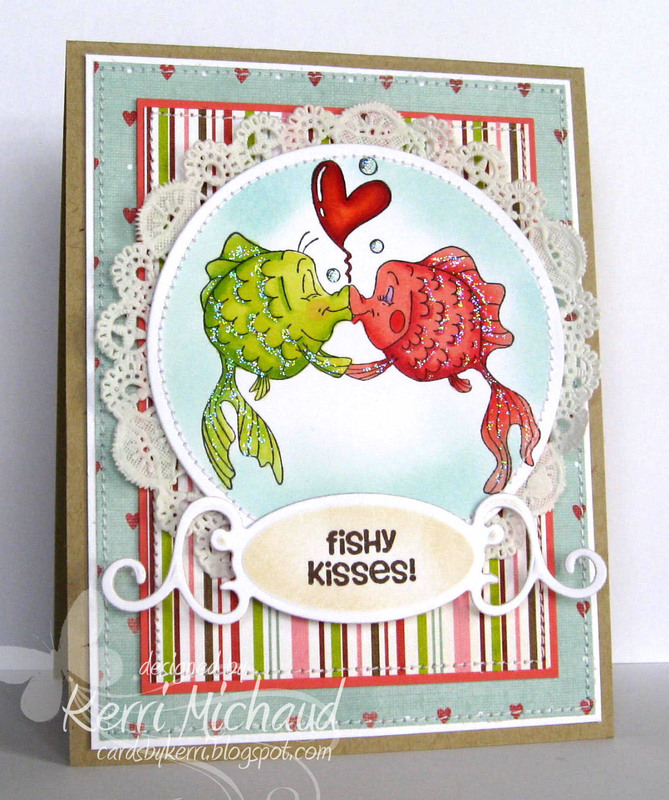 Krafty Peeks Day 2~Fishy Kisses! Hello! Are you ready for Day 2 of December Krafty Peeks from Kraftin' Kimmie Stamps?! Love is definitely in the air today as we show off the new images from Emilie Goulet! For my card, I used these adorable Fish from Emilie's new set called Lots of Love 1. Aren't they darling???!! I went a little crazy on the glitter though LOL! The dp is some old Bo Bunny A Gift of Love. Make sure you check out the Kraftin' Kimmie Stamps Blog once again to see who is showing off these adorable images today, and leave some love because TWO random commenters are going to win Emilie's new set!!! Gorgeous Kerri! Love the touches of bling! great card, love the sparkle! oooooh, my.... what a great and funny card ! it makes me smile ! Never too much sparkle for me. I think it's perfect and that heart is sooo dimensional. Kerri, no way can you ever go crazy with glitter! The glitter looks awesome on your card! Great job! this is so cute and such a sweet card, Kerri! love it! I like this card! I have to buy this image and can only hope I do half the job you've done. Love all your sparkle!